Prayer is our connection to our Father! We cannot survive without constant communication with Him. The Bible tells us to “pray without ceasing” (1 Thessalonians 5:17). We believe that prayer is one of the most powerful ministries of the body of Christ and that God does great things when we gather together to pray for each other. We have a prayer chain e-mail that is sent out to a few hundred praying people in our congregation. 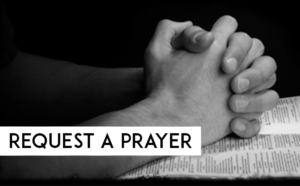 If you have a prayer request that you’d like to be sent out on our chain, please click the “Request a Prayer” button below & type out your prayer request.